Check the next example of how you can enrich a text article by a simple illustration. I share here some simple do-it-yourself ways. So it can inspire you to make your own Do-It-Yourself blog infographics or of other written articles. I was reading an interesting blog post at Harvard Business Review by Rosabeth Moss Kanter. She was writing about ways to cope with uncertainty in a life. Tips she shares were a good source material for adding a visualization. How did I design this visualization? 1st point talked about providing a path – for which the block process diagram sketch is just perfect. First of all, adding scribble filling represents “today we stand here” statement. I added two versions of this little information diagram, the simple ones with 3 blocks only and more complex one showing also possible forks and alternative paths. 2nd point showed tackle maintenance repair – so let’s add there a wrench. 3rd represented creativity and brainstorming for which a light bulb is a simple and well-recognized symbol. 5th was about reminding people values and purpose, while such abstract terms are not so easy to represent. I considered using a symbol of scales or figure heading somewhere forward. Finally, I decided to use a target (bullseye). It is probably a bit cliche, but a well readable symbol of having a goal. Hence I was thinking whether not to add visualization for the whole blog post (“uncertainty” could be presented as the lightning icon, or figure with a question mark). However, the more visuals would add to its complexity. As a result, the main message (5 pieces of advice) would be weaker. 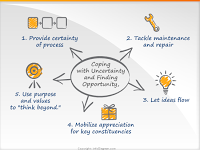 After all the uncertainty is not the key issue here, but how to cope with it. PS. If you want a similar diagram for your articles, let me know, best via infodiagram.com contact webpage.